Pinterest Blocked My Website - BUT There Is GOOD News! 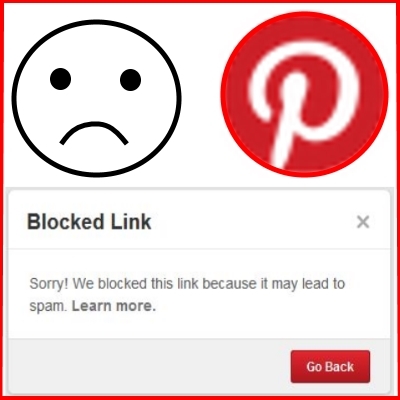 Pinterest Blocked My Website – BUT There Is GOOD News! Yesterday I received numerous messages from my readers that they were unable to pin my content in Pinterest. It looks like Pinterest marked my website as SPAM yet again ???? 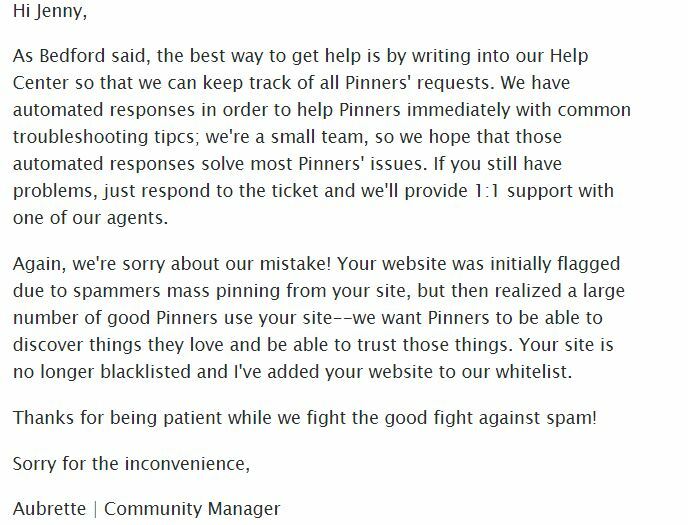 The same issue happened more than a year ago but thanks to the huge help of the community, Pinterest realized that they made an error and promised me that it won’t happen again. They actually told me to contact them if it happens again. Well, guess what – it happened again! And I’ve followed their instructions to contact them. 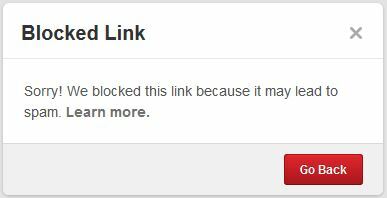 I’ve contacted Pinterest a few times but all I managed to get was a generic reply that they put my website in the “blacklist”. They did NOT make any extra effort apart from copying their generic reply and email it to me. Is my website associated with spam?? You must be joking!!! 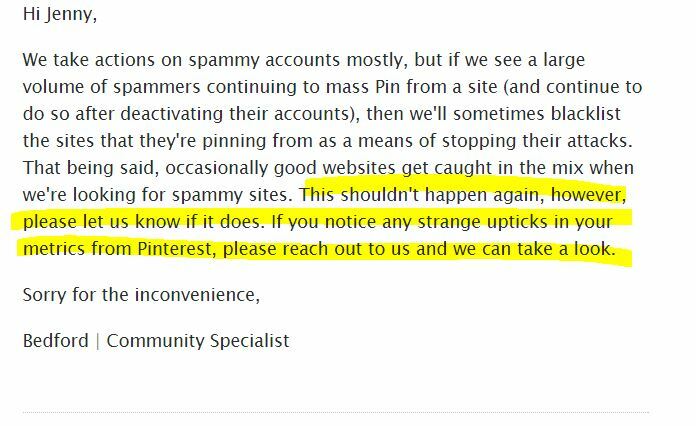 I have asked my community to help me and raise their dissatisfaction with Pinterest and “suddenly” someone actually bothered to look into it. If it wasn’t for the huge support of the community, they would have completely ignored me and kept sending me their useless automatic replies. But I was NOT happy with that reply. So what should I do if it happens again? Obviously the “support” doesn’t provide any support – who should I REALLY contact if I need support. When I saw this message, the first thing that came to my mind was how ridiculous this can be. I did contacted support and let them know about it at the beginning – didn’t I? But they did NOTHING! Do you really expect me to believe you? I also contacted my website admin and we looked at the logs – we couldn’t see any suspicious activity at all! I have a lot of followers on Pinterest and in social media and I don’t have any control on what THEY do with the pins. It might be that someone tries to sabotage my work and my website and did it deliberately. So what can I do about it and what is PINTEREST going to do to prevent it from happening again? Did you notice that they say that they’ll provide 1:1 support? I have no idea what they are talking about! The main issue that I have is that anyone can damage a website by doing mass pinning. Support will not help and the only thing that can help is to ask your community to get involved. Pinterest – you can do a much better job than that. A company that is worth 11 Billion dollar can invest in much better support. I’ve contacted the Press department in Pinterest to get their formal reply and hopefully speak with a real person but I am still waiting for them. If anyone knows how to contact their CEO Ben Silbermann please let me know. I want to speak with him personally and give him a few ideas for improvement. P.S – As a precaution, I do not allow pinning from my website until I get the contact details of a real person in Pinterest whom I can speak to. So you will not be able to pin any content for now. 8 Responses to Pinterest Blocked My Website – BUT There Is GOOD News! I like to read and learn about health topics on Pin interest, Facebook, or where ever I see them. Do not block these facts and learning experience from Pin Interest. I have an avid interest in the health information and advice provided by the health and natural world, and I would like it to remain accessible for the great benefits it offers to subscribers. The health information of Healthy and Natural World provide me with daily updates on a variety of topics; I find this website and the advice it offers extremely helpful in being able to heal maladies naturally. I also share this information with friends and family. It is important that this site, Healthy and Natural World, continues its mission of helping people, also via Pintrest. I’m interested in the health information and advice provided by the health and natural world, and I would like it to remain accessible for the great benefits it offers to subscribers. I love the articles. I have learned very useful information on some health issues I am currently facing. Blocking this website is a very bad decision. Please make every effort to resolve this issue as soon as possible. They did the same with my website also, and I’ve emailed them four times. Same generic non-response every time. I don’t even get a response, just a “were you happy with our service?”. They don’t even tell me the outcome of the investigation that doesn’t happen. I am a content creator and freelance writer with five almost identical websites, just with a slightly different theme – nails, hair, health, etc. and only one of them has been blocked. They won’t acknowledge that they have unfairly blocked one website.